LAS VEGAS (December 11, 2017) – MGM Resorts International today announced that its WNBA franchise will be called the Las Vegas Aces. Las Vegas’ first major professional basketball team – formerly the San Antonio Stars – will begin play in its new home in the 2018 season. 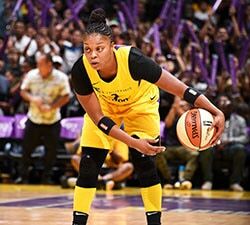 Las Vegas-based entertainment and hospitality leader MGM Resorts received unanimous approval from the WNBA and NBA Board of Governors in October in connection with its purchase and relocation of the team from San Antonio to Las Vegas. In its inaugural season in Las Vegas, the Aces are expected to play 17 home games at the Mandalay Bay Events Center, adding to MGM Resorts’ outstanding lineup of live entertainment experiences. The company is home to more than 20 world-class arenas, theaters and outdoor venues, selling 8 million tickets annually for live events ranging from performances by renowned artists such as The Rolling Stones, Cher and Bruno Mars to some of the biggest fights in the history of combat sports. Fans can make a deposit for Las Vegas Aces tickets through AXS.com. Deposits can be applied toward season tickets, multi-game packs, or single game tickets. The opportunity to buy season tickets will be offered to deposit holders in the order in which they signed up and seat availability is not guaranteed. Season tickets will go on sale to the public in early 2018. Follow @LVACES, #LVACES and visit wnba.com/lasvegas for additional information. The WNBA – which features 12 teams and is the most successful women’s professional team sports league in the world – is a unique global sports property combining competition, sportsmanship, and entertainment value with its status as an icon for social change, achievement, and diversity. 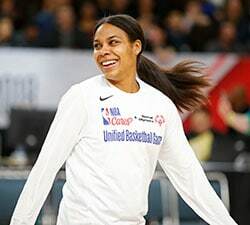 Through WNBA Cares, the WNBA is deeply committed to creating programs that promote a healthy lifestyle and positive body image, support youth and family development, and inspire and empower women. 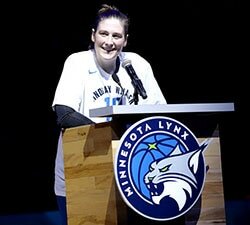 For more information on the WNBA, log on to www.wnba.com. MGM Resorts International (NYSE: MGM) is an S&P 500® global entertainment company with national and international locations featuring best-in-class hotels and casinos, state-of-the-art meetings and conference spaces, incredible live and theatrical entertainment experiences, and an extensive array of restaurant, nightlife and retail offerings. MGM Resorts creates immersive, iconic experiences through its suite of Las Vegas-inspired brands. The MGM Resorts portfolio encompasses 27 unique hotel offerings including some of the most recognizable resort brands in the industry. The company is expanding throughout the U.S. and around the world, developing MGM Springfield in Massachusetts and MGM COTAI in Macau, and debuting the first international Bellagio branded hotel in Shanghai. The 77,000 global employees of MGM Resorts are proud of their company for being recognized as one of FORTUNE® Magazine’s World’s Most Admired Companies®. For more information visit us at www.mgmresorts.com.